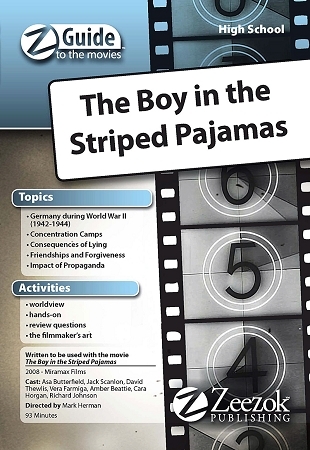 Zeezok Publishing's Z-Guide to The Boy in the Striped Pajamas is a great way to incorporate media into your study of World War II. This guide contains a topic overview movie synopsis and ten learning activities for an in-depth study of the film. Learn more about the Auschwitz concentration camp. Identify examples of Nazi propaganda and defend the films message against those critics that say it presents an unrealistic portrayal of the Holocaust. Produce an art project about the film or complete The Boy in the Striped Pajamas crossword puzzle. Evaluate your own beliefs with the Worldview Activity probe the directors mind with The Filmmakers Art activity and get the entire family involved with the For Family Discussion section at the end of the guide. Choose those activities which best fit your students course objectives areas of interest or time schedule. This is a great film with an unforgettable ending. Movie Summary: Follow the life of young Bruno as his father a German SS officer becomes a concentration camp commandant in Poland. Confined to certain sections of the property lonely Bruno longs for companionship. He meets and befriends a boy from the local farm. Their friendship thrives in spite of an electrified fence cultural differences and Bruno's lie which gets Schmuel a vicious beating. After viewing a Nazi propaganda film about the farm Bruno goes under the wire to his friend with tragic consequences for himself and his family. This Z-Guide is based on the movie Boy in the Striped Pajamas (2008). You can view a trailer for the movie below.